The Weeden Manufacturing Company produced many toy novelties starting in the late 19th century, but was best known for its stationary steam engines. It was founded by watch maker William Nye Weeden. This U.S. company made its mark in history competing with German manufacturers from the Nüremburg area such as Bing, Doll, Märklin, Plank and Schöenner as well as Brittish manufacturers Mamod, Bowman and Burnac. It all started when a childrens publication named 'The Youth's Companion' approached William Nye Weeden and asked him to design an inexpensive, quality toy that the magazine could use as a premium in an effort to increase subscriptions. Weeden designed an upright steam engine for these purposes. Its design, quality and function impressed the publication so much that they awarded Weeden an initial order for ten thousand units at one dollar each. This $10,000.00 became the impetus for the formation of The Weeden Manufacturing Company of New Bedford, Massachusetts in 1883. The company remained in business until 1952 producing a vast line of steam powered products that included the stationary engines, mobile tractors, boats and trains. Weeden’s Upright Steam Engine #1 made its first appearance in the October 1884 issue of 'Youth’s Companion' magazine. This was the stationary steam engine with an upright boiler, offered for the $1.00 price tag. In the 1870’s and early 80’s, it was somewhat common for hobby magazines to offer these types of educational toys. This magazine had previously offered steam engines made by the Buckman Company of New York for these same purposes. In addition to the toy steam engines, Weeden produced many other toy novelties. Weeden often made his own tooling for the items he manufactured - presses, dies, molds and other production items. Realizing the value and the uniqueness of these specialty tools, patterns and dies he had them locked away in a fire-proof safe at the close of business each day. In the 1880's weeden produced a floor toy train consisting of a live steam locomotive pulling a tender and passenger car. These were very popular and over the years thousands were sold. These types of live steam floor trains were referred to as "dribblers" because of the steam and hot water they spewed over the carpets and floors of many homes. Operation of these trains is basic. The locomotive boiler is filled with water thru a 'water riser' just forward of the cabin. Fuel was placed into the reservoir of the burner unit which had three or more alcohol fired wicks, resting underneath the boiler. When ignited, the water is heated into steam. The steam is forced into a pair of oscillating cylinders which are connected via drive rods to the locomotive wheels. It is a unique and simple system to move the drive rods that propel the engine around the floor. The Weeden Manufacturing Company introduced the Dart locomotive in 1888 and continued production of this model until 1918. This is considered by many to be America's most successful early toy train. Tens of thousands of this popular model were sold in sets. It came in a wooden box in two versions. One was just the locomotive with track. The other included the locomotive, tender and a passenger coach with track. In 1890 a third set was offered which featured colored paper lithographs of a train station, stage coach, baggage cart, workers, and passengers, which could be cut out and mounted on wood or cardboard. There are actually two types of Dart locomotives, early and late. The early models are identified by the three wick burners. 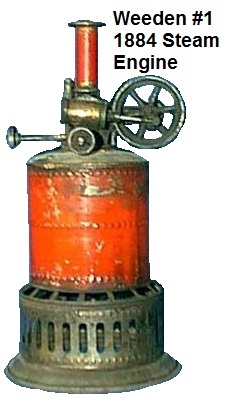 The later model employs a four wick burner. The later model is fitted with a nickel plated steam cylinder and fill cap/safety valve whereas the parts on the earlier models were painted. It is believed that National Playthings, who eventually acquired Weeden, reintroduced the Dart again in the 1940's, constructing them from a combination of left over and newly made parts. The Dart loco was 8" long and had a boiler made of polished brass or black-enameled steel. The cab was made of steel, finished in black enamel or chemically blued, and the roof was painted in maroon or red enamel. The boiler running boards/side skirts were made of brass, and were imprinted with the Weeden logo and the number 1887. The drive wheels were cast iron finished in black or red enamel and the pilot wheels were dummy sheet metal outlines painted either red or black. The cowcatcher was made of steel, and finished in black enamel or chemically blued. The cylinders were single or double piston drive and instead of being fixed, moved with the angle of the drivers as the wheels turned. This design movement aligned holes on the inside face of the cylinders with steam supply holes for power stroke, and uncovered holes to allow exhaust to the atmosphere. The cylinders on each side were opposed on the supply and exhaust cycle which allowed for a steady motion. The main rods were attached to the front drive wheels. There were no connecting rods between drivers. The 1895 Montgomery Ward & Co. Catalogue and Buyer's Guide listed Item #24761 Weeden Steam Locomotive, tender and passenger car, with jointed track on wooden sleepers, entire set in wooden box for $3.50. Track was in the form of sheet metal strip rails and wooden ties that had to be fitted together. Inner curved rails were 6½" long, and outer rails were 7¼" long. When assembled, the track formed a 42" diameter circle, in 2 3\16" gauge made up of 18 outside and 18 inside rails, and 36 sleepers. The tops of the rails were rounded, not flat edged as in the Carlisle & Finch and early Lionel banded track. The depth of the cuts on the sleepers made the outside rails sit higher, resulting in a slight superelevation. The rail ends were connected using a traditional (but at the time new) pin and socket system. In 1904 a nine-section “special track system” was offered, which made the same circle using the same rails/sleepers permanently mounted on wooden boards which could be locked together with hinged metal clasps. The Weeden #3 Locomotive is a larger version of the Dart. It measures 12" long, 3¼" wide and 4½" high. It was introduced around 1903 and produced for a couple years. The complete train had a tender and two passenger coaches, identical to those of the Dart, and came with a 5' diameter track. These sets did not sell very well and are scarce. The tenders supplied with the Dart and #3 were black with a red frame and had “I. & A.R.R.” embossed on the sides. There were two types of tenders - one version in a fixed four-wheel style with black wheels and an eight-wheeled moveable truck version with red wheels. The passenger car was steel finished in red enamel with a black roof. It was embossed with obscure lettering above the windows ”BARBARY EXPRESS I.A. & R.R.”, and below, more plainly, “CITY OF NEW BEDFORD”. One variation on these cars relates to the car floor – early cars were lightened by cutting a large rectangular area from the floor. Later cars had a large 8-sided piece cut out, similar in size to the earlier rectangle but with diagonals at the corners instead of square corners. The change might have been to add strength to the floor. Normally the trucks on these cars were outside frame but inside frame versions have been found. Couplers on these cars were just a piece of wire shaped like a hook, and each car had an eyelet on the end for latching the hook from the next car. The Weeden #1 Steam Locomotive was introduced in 1931 and produced into 1933. It was 12" long X 2½" wide and 4" high. It was an 'O' gauge 4-4-0 locomotive that could be run on standard 'O' gauge 3 rail or 2 rail track. The locomotive came without a tender or cars. It was designed to pull 'O' gauge cars made by other manufacturers. The locomotive was an alcohol-fired, 6 wick, live steam engine with a jackshaft drive. It is driven by two oscillating cylinders. Steam is exhausted up the stack via tubes that carry the spent steam from the cylinders. These locomotives are not known to be very good pullers however. It pulls with all four drivers, which are powered by a gear train from the crankshaft to the front axle via an idler gear, and then to the back axle through another idler gear. The siderods are slotted and don't transmit any power. This model was Weeden Manufacturing Company's attempt to re-enter the toy train world after many years of not offering live steam driven trains. It cost $15.00 in 1931. The #2 locomotive, which looked exactly like the No. 1, was an experiment. This model employed an electric heating element inserted in the boiler backhead which was intended to heat the water instead of using an alcohol burner. It was designed to run on 'O' gauge 3 rail track, with a transformer providing the necessary current through the tracks to pickups on the locomotive. This train was briefly advertised but in reality only one is known to have ever been made by Weeden. In 1936 the Steam Electric (SE) Company purchased one hundred Weeden #1 alcohol-fired locomotives and it is believed that about half of the locomotives were converted to electric ‘firing’, cataloged and sold, with a 300-watt transformer for $14.50 as the SE #1 model. The remaining locomotives are thought to have been sold without modification by Steam Electric, possibly due to a lack in sales of the electric models. Since 300-400 watts of electricity was required to heat the element, this locomotive turned out to be impractical and the project was not successful. The #2 engine is extremely rare. The Weeden Manufacturing Company remained in business for a long time and made a large variety of stationary toy steam engines and trains during those years. William Nye Weeden actually only ran the company for 8 years until his death in 1891. William Richie, who was a former salesman took over as chief executive. When he passed away in 1939 his son William B. Richie followed him at the helm until 1942 when the company was sold to National Playthings which halted production of the line of steam engines in 1952. The remaining machinery, parts, dies, molds and patents for the steam engines were purchased by Security Signals Inc. for around $800 and kept in storage, until finally destroyed years later.